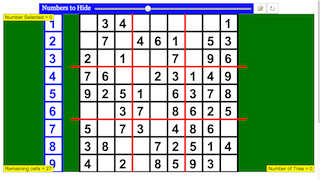 Sudoku(数独 sūdoku, digit-single) (/suːˈdoʊkuː/, /-ˈdɒk-/, /sə-/, originally called Number Place) is a logic-based,combinatorialnumber-placement puzzle. The objective is to fill a 9×9 grid with digits so that each column, each row, and each of the nine 3×3 subgrids that compose the grid (also called "boxes", "blocks", or "regions") contains all of the digits from 1 to 9. The puzzle setter provides a partially completed grid, which for a well-posed puzzle has a single solution. Don't like the sudoku generated? Click on the reset button for a new one. so do not worry about encountering any unsolvable sudoku. This can be done by toggling the Numbers to Hide (blue) slider. Moving to the left will reveal more numbers, giving easier difficulty. While moving to the right hides more numbers, giving higher difficulty. Note that after Step 2, you won't be able to manipulate this slider anymore. You need to pick a number from the blue list on the left of the sudoku board. Clicking from the list will highlight the selected number with yellow. In this case, the number selected is 3. You are now equipped with that particular number. This can be further checked on the top left hand corner of the screen. Throughout the sudoku there are empty cells waiting to be filled. If you have a number selected, clicking on the empty slot will fill it with that particular number. It also will highlight that particular slot with yellow. Filling the wrong number into the cell will give it a red. Note that after filling in a right number, that particular cell will become unselectable. Filling up all the remaining slots correctly will show you a completion message. This will also display to you the number of tries to finish this Sudoku piece. Feel like giving up or just want to see the solution? showing you the answers to the piece. Displays to you the remaining cells left to fill. Displays to you the number of tries you have made. Double click anywhere in the panel to toggle full screen.